Here's the next installment of The Wilson Files. He wasn't getting some things in the mail he was expecting. Like the catalog he had requested from a freeze-dried survival food outfit in Utah. In fact, he wasn't getting any mail at all. He wouldn't use the internet, so catalogs in the mail were very important to him. Then his mom said she'd sent him something, but he never got that, either. He was getting pretty upset, and I didn't blame him. We didn't get home delivery, but had multi-box units along the highway. 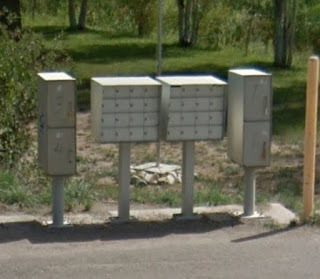 (The picture above, courtesy Google Street View, is the actual bank of mailboxes in the story.) He saw the mail carrier stuffing mail in the boxes and stopped to ask her about his missing mail. I wasn't there, so I really don't know what was said, or how he said it. He could be a little intense. He suspected she was stealing his mail, and he probably said as much. Then when he didn't get a satisfactory answer from the carrier, if I remember correctly, he went to the post office in town and complained about his missing mail. A couple of hours later a pair of cops or deputies (he didn't live in town, but town cops often left town to spread their "service") came to his house to talk to him. His door was slightly ajar, so the cops just pushed it a little more and stuck their heads in the house while calling his name. Of course, their guns were unholstered "just in case". Wilson was familiar to them. They said the mail carrier claimed he had threatened her. He said he was just asking where his mail was going. The cops said threatening a postal employee was a federal crime. He said he made no threats, he just wanted his missing mail. The cops told him to watch what he said to the carrier, and that it would be best if he didn't speak to her again or approach her while she put mail in the boxes. Everyone survived the encounter, and Wilson wasn't arrested. Funny thing was, the next day he started getting mail. I can't remember if he ever got the item his mom had sent, or the catalog of survival foods. But that seemed to be the end of his missing mail problem. To Wilson (and to me) this seemed to confirm his suspicions that the carrier was responsible for his missing mail. You aren't paranoid if they really are out to get you. 1 - Build an explosive, then put it in a box and set it to detonate when the box is opened. 2 - Wrap it up and mail it to yourself. 3 - Watch the news to see who won't be stealing any more of your mail. I'd considered something like that for package thieves (although I would use a non-lethal payload). I'm not sure I approve of actually mailing such a device. If you set it on your porch with your name on it, the odds of an innocent person being harmed are virtually zero. Mailing it is risky, since there's a possibility of an accidental detonation. What happens if an innocent person drops the package while in transit, setting it off? Statists don't care who gets harmed by their actions. Voluntaryists do, so we take full responsibility for our actions and do our best to never harm the innocent. That's what makes us better than them. I was only kidding - dark humor. There are many ways to negotiate that situation. You can just as easily use another delivery service that tracks packages or mail yourself your own tracking device, set up a camera or whatever.